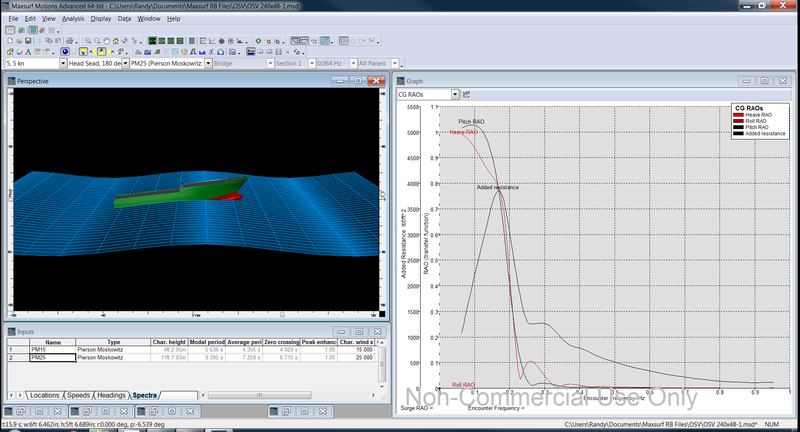 Maxsurf Motions provides Hydrodynamic Motions and Seakeeping Analysis in the Maxsurf Advanced and Enterprise software suites. It uses the trimmed Maxsurf NURBS model eliminating the need to prepare input or offset files. It will predict the motion and response of vessels in a range of sea states at user-defined headings and speeds. Naval Architects are able to optimize the vessel design with an in-depth understanding of Response Amplitude Operators (RAOs), accelerations, and Motion Sickness Incidence at any location on the vessel. Data is displayed simultaneously in graphical and tabular form and is automatically updated in real time when changes are made as the analysis progresses. Data can be copied to spreadsheets and other applications for presentation purposes or further analysis such as calculating the probability of slamming and propeller emergence in heavy seas. 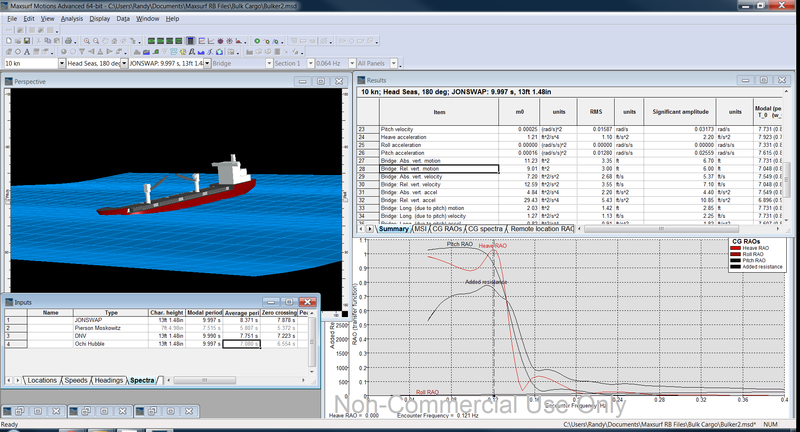 Maxsurf Motions is also able to provide an animation of the vessel’s response to specified sea conditions. To See a YouTube Demo of Maxurf Motions for an OSV, Click This Link. During the quick set-up of the analysis, you can specify the wave spectrum (from a selection of five in the menu), heading, vessel speed, and other mass distribution parameters such as VCG of the vessel and Gyradii. 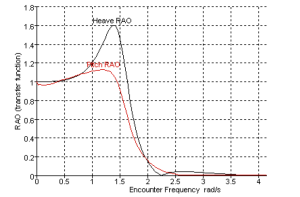 RAOs are computed, as well as the added resistance, significant absolute and relative motions, velocities, and accelerations of the vessel in the specified sea spectrum. Motion, velocity, and acceleration and Motion Sickness Incidence (MSI) may also be computed for any position on the vessel. Both Strip Theory and 3D Radiation-Diffraction Panel Methods are available. Strip theory provides fast calculation of heave, pitch, and roll response for hull shapes with L/B (length-beam ratio) greater than 4. 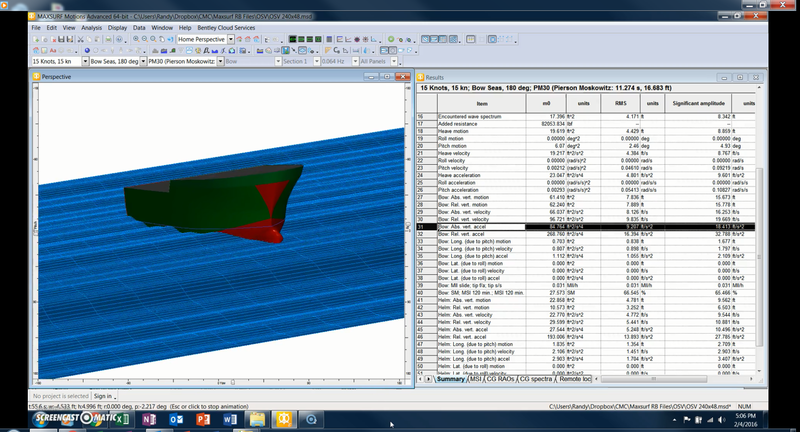 The panel method (only available in the Maxsurf Enterprise Suite) can be used for any vessel shape and provides full six degrees of freedom response calculations. Maxsurf Motions has been validated against a variety of data from various independent sources including model tests, full scale trials, and other numerical methods. 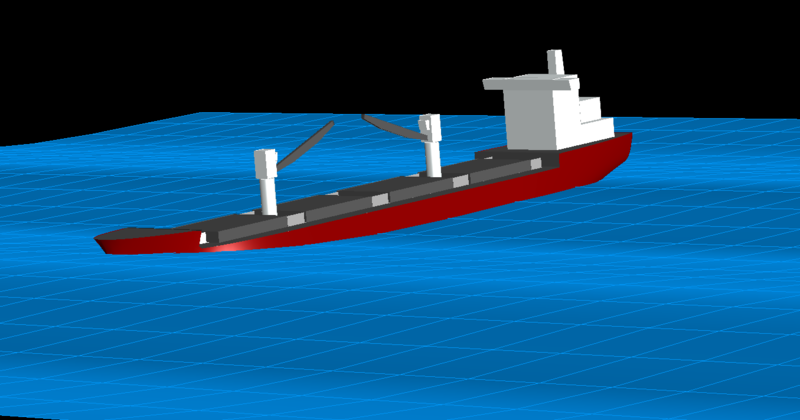 The linear strip theory method is based on the work of Salvesen et al, and it is used to calculate the coupled heave and pitch response of the vessel. The roll response is calculated using linear roll damping theory. In addition to graphical and tabular output of numerical results data. The strip theory computations have been found to be most reliable from head seas (180 deg) to bow-quartering seas (135 and 215 deg). Strip theory calculations for following seas are less accurate and should be validated by other means, since the motions become much more nonlinear. The panel method is a first-order diffraction/radiation hydrodynamic analysis in which a constant panel based boundary element method (BEM) is used. 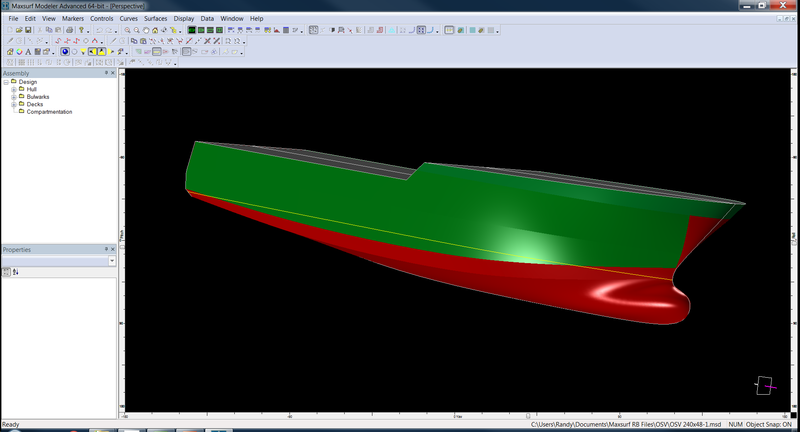 The panel method generates its analysis elements based on the Maxsurf NURBS surface model. The panel method generates Response Amplitude Operators (RAOs) for all six degrees of freedom: surge, sway, heave, roll, pitch and yaw. The panel method is valid for a very large range of geometries but is restricted to zero forward speed. In addition to outputting RAOs, the panel method output also includes hydrodynamic added mass and damping, first order wave exciting forces and moments, mean drift forces and moments, and pressure on the vessel wetted surface. 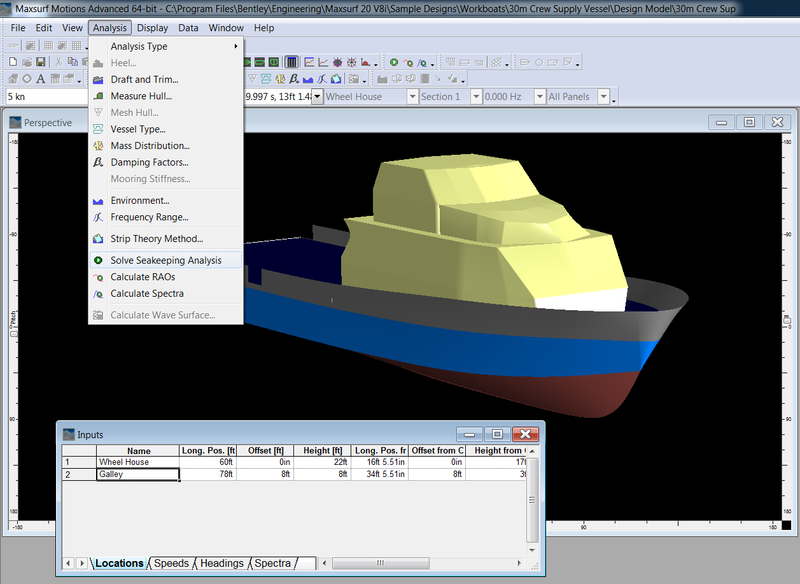 Maxsurf Motions will quickly provide reasonably accurate seakeeping predictions for a wide range of vessel types provided that the Naval Architect utilizes the tool as recommended in the user manual. If you click the screen shot shown below and review it closely, you will gain a better understanding of the extent of insights gained from a Maxsurf Motions analysis. 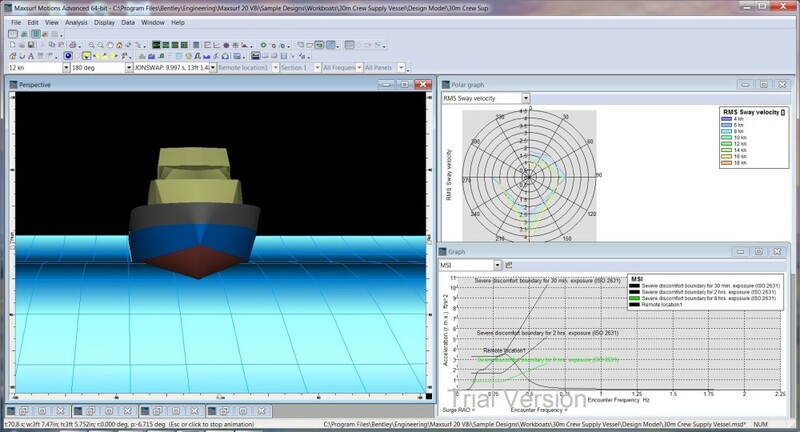 For example, you can freeze the animation of the vessel encountering a wave at any point and in the lower left corner of the screen, know the precise data point in the applicable results table. This data can easily be analyzed further in an Excel spreadsheet. For most purposes, it is sufficient to model the vessel as a set of coupled spring, mass, damper systems undergoing simple harmonic motion. This is assumed by Maxsurf Motions and most other seakeeping prediction methods. This method may be successfully applied to the analysis of the vessel’s motions provided that these motions are linear and that the principle of superposition holds. These assumptions are valid provided that the vessel is not experiencing extremely severe conditions. It may be seen that the RAOs tend to unity at low frequency, this is where the vessel simply moves up and down with the wave and acts like a cork. 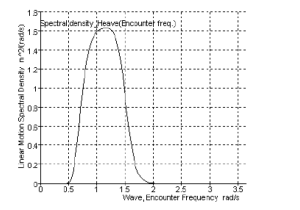 At high frequency, the response tends to zero since the effect of many very short waves cancel out over the length of the vessel. Typically the vessel will also have a peak of greater than unity; this occurs close to the vessels natural period. The peak is due to resonance. An RAO value of greater than unity indicates that the vessel’s response is greater than the wave amplitude (or slope). Assuming linearity, the vessel’s RAOs depend only on the vessel’s geometry, speed and heading. Once the RAOs have been calculated, the motion of a vessel in a particular sea state of interest may be calculated. Therefore, Maxsurf Motions can determine a spectrum for a particular vessel’s motion in a defined spectrum. ** For an in-depth series of five technical web sessions reviewing Maxsurf Motions (formerly called Seakeeper), just click this link.